Last week I attended the first Freifunk meeting in my hometown. The decision was made to participate to FFBsee with my old Buffalo WHR-HP-G300N router. Before flashing the latest Freifunk firmware I tried to install a vanilla OpenWrt image for this router. But the outdated DD-WRT image on this router refused to get updated. After several retries I gave up on the suggested tftp method. I tried several combinations of MAC-Addresses and interfaces always without success. Luckily Kevin Cave on Scarygliders pointed out that the U-Boot on the router can be interrupted with CTRL-C when it tries to request a firmware by tftp. He also pointed out that the OpenWrt image is prefixed with some 0x20 byte header. So I tweaked the U-Boot environment a bit so I could skip to alter the firmware. 80f00020: 27051956 d3488451 56acca20 00115622    '..V.H.QV.. ..V"
80f00090: a6181f38 843f1584 43cbe578 c27d99b4    ...8.?..C..x.}.. 80f000c0: 76abd394 bebfacf4 f08fe76a db6961b8    v..........j.ia. 80f000d0: d341676a 67864eb5 e28b8dbd 3dbb489e    .Agjg.N.....=.H. 80f000e0: 978fb0a7 01f8fcc8 a0ebe5e4 54e07d07    ............T.}. Please do not save the environment after this modification otherwise your router will may not work properly after this. This is just a temporary modification! Bingo! This looks promising. We now have to erase the flash and copy the image to it’s new place. Now it is time to check if everything went fine or if we have created something for the dust bin. This looks like full success to me. Next step will be increasing the flash size to 8 MB to provide enough space for the FFBsee firmware. After playing with UDOOBuntu and the nice USB OTG Gadget support my decision was to provide something similar for my Yocot Port as-well. It turned out that the serial Gadget support was pretty easy the Ethernet support is more complex. MACHINE_FEATURES += " usbgadget usbhost"
This adds usbgadget support and automatically loads the module g_serial on startup. The line SERIAL_CONSOLES automatically spawns a getty on /dev/ttyGS0 through the inittab. This will automatically provide serial support and spawns a usb0 network device device on the target and the host. But my Ubuntu host was not able to set get an IP-Adress for this interface. Setting one by hand resolved this. But this is not comparable to the out of the box experience UDOOBuntu provides. [ 9515.377616] userif-3: sent link down event. [ 9515.377619] userif-3: sent link up event. For serial console access you can connet to the UDOO Neo by attaching minicom to /dev/ttyACM0 at 115200 Baud 8N1 No flow control, or any other treminal emulator of your choice. Yesterday my long time awaited UDOO Neo board has arrived. They do provide a really good getting started guide for UDOO Neo. But for my Yocto Port I need access to the serial console to check the output of the U-Boot and the kernel. So I’ve checked the UDOO Neo Schematics and located UART1 on the connector J7. 1 x USB to serial converter with 3.3V output. Do not use any 5V type, this may damage your UDOO Neo! I use some cheap Chinese CH341 USB to UART converters. They cost about 3€ but are not FTDI clones. 1 x Powersupply for the Neo. For power connection and flashing the SD-Card please have a look at the getting started guide for UDOO Neo. Before you plug-in the serial wires you have to remove any power source from the UDOO board. Otherwise you may damage your board. Double check if your adapter is a 3.3V. 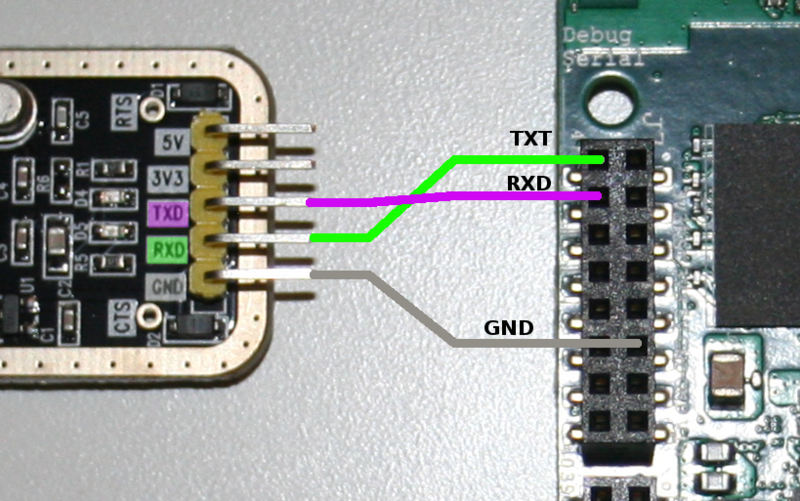 Connect the ground line (GND) of your USB to serial converter with the PIN 11 of the J7 connector. Then you have to connect the RX and TX PINs. But remember you have to cross them. Why do we need to cross RX and TX? This is because TX is transmit and if the UDOO Board and your PC are transmitting on the same line nothing is received on both sides. So you have to connect the RX PIN of the UDOO board, PIN 4 of J7, with the TX PIN of your converter. The TX, PIN 2 of J7, from UDOO is connected to the RX PIN of converter. I do prefer minicom under Linux for this job. You may have noticed while booting the official UDOOBuntu image image a new disk is suddenly mounted on your PC. And you have a new network interface connected as well. Last but not least even a new serial interface is available. You can use minicom with /dev/ttyACM0 and the same settings like above. Maurice le Rutte asked me on Twitter if it is possible to add support for the first UDOO board and building a DirectFB enabled image. After some research it looked like a solution for the DirectFB task should be not that big issue. The first two lines remove support for wayland and X11 which will conflict with DirectFB and will prevent a successful build. With this modification you can build a DirectFB image. The extra white space in front of directfb is mandatory! This is the right time to fetch some coffee. After beeing part of the Kickstarter campaign for the UDOO NEO board. I am looking forward to play with this little beast. During the meantime I decided to add the UDOO NEO board to the Freescale OpenEmbedded community layer. Due to the fact my board did not yet arrived I’ve not yet created a patch to ask for integration into the official Freescale OpenEmbedded community layer. This will be done when I’ve tested the layer. If you are interested in my work you can find my personal fork right here at github. You have to use the fido branch. To keep things simple I’ve created my own branch of the fsl-community-bsp-platform repo repository. At the end of the commands you have every metadata you need to start work with. If you want to develop your own software for the UDOO Neo you’ll need some cross toolchain. This can be achieved very easy with the OpenEmbedded universe. In case of any questions just leave a comment on my Blog. The STMicroelectronics STM32CubeMX is delivered as a exe file what implies that it is eintended to run on Windows systems only. But due to the fact it is a JAVA application we can run it on Linux as-well. This is a work in progress article and will be updated over time. After my decision to build a full Open Source Software based DVB-S2 USB module I ordered some PCI-Express connectors from China on Aliexpress. The delivery time was quite low I received my package about 11 days after placing my order. This is really quick for standard delivery from China to Germany. Next step will be adding this connector to Eagle PCB Design Software. And designing a small breadboard to PCI-Express board and host it on OSHPark. I have not found any data sheet for this connector yet. On one side it has an engraving with ,,tyco/Electronics” and on the other side some code ,,08306ED’‘. After some research I found a ,,data sheet’‘ ENG_DS_4-1773442-7_0308-2.pdf but it lacks detailed drawings about the PIN pitch. After some research I discovered that those connectors are described in the PCI Express Card Electromechanical Specification. Some time ago I thought it would be fun to build a USB DVB-S2 device which runs on 100% OpenSource Software. Due to the fact I do not have any tooling for soldering complex chips I decided to build this project on hardware which is already available. For interconnection of the DVB part with the PC or a Single board computer like the ODROID-C1 or Raspberry PI my decision was to use a Cypress FX2 CY7C68013A evaluation board. You can buy them for under 10€ in far east on ebay. 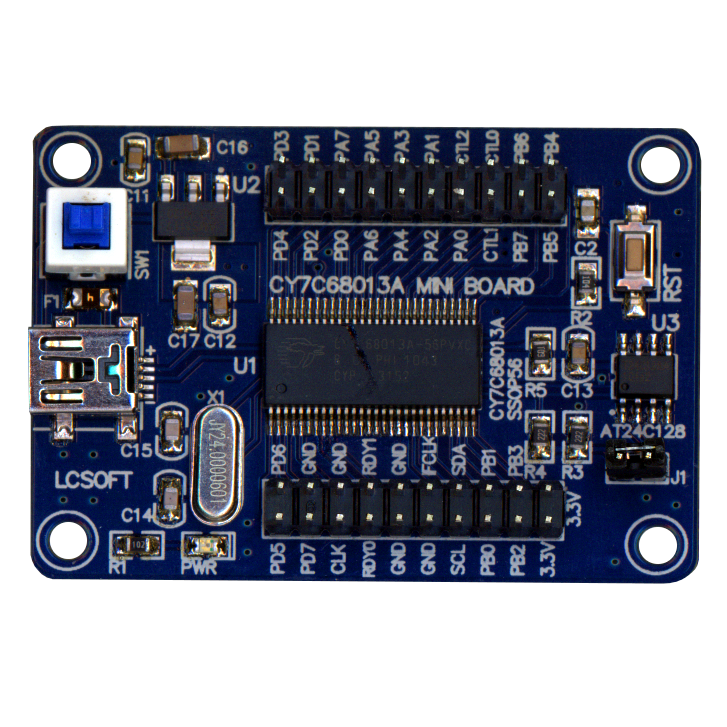 I bought one of the Lcsoft Mini Boards. The coreboot project provides a schematic for the Lcsoft board. The Cypress FX2 CY7C68013A is based on a 8051 core. Not one of my favorite hacking platform but I’ll give it a try. There is a Open Source Framework for firmware development it is called fxlib. After some research on Google I found the project Termini. The firmware for the Termini hardware is available via the linuxtv.org CVS repository. They provide a specification for the USB communication between the host controller and the FX2. There are already some USB 2.0 USB DVB-S2 devices based on the Cypress FX2 CY7C68013A like the DVBSKY S960. The last part in the jigsaw puzzle is the DVB-S2 tuner and demodulator part. Some of the linux based Set-Top-Boxes provide swappable tuner modules one of them is the manufacturer GigaBlue. They sell a DVB-S2 Tuner based on the Serit SP2246 NIM for DVB-S2. The SP2246 is based on the STV6111 tuner and the STV0913 demodulator. It looks like the tuner module is connected via a PCI-Express x1 36Pin connector. 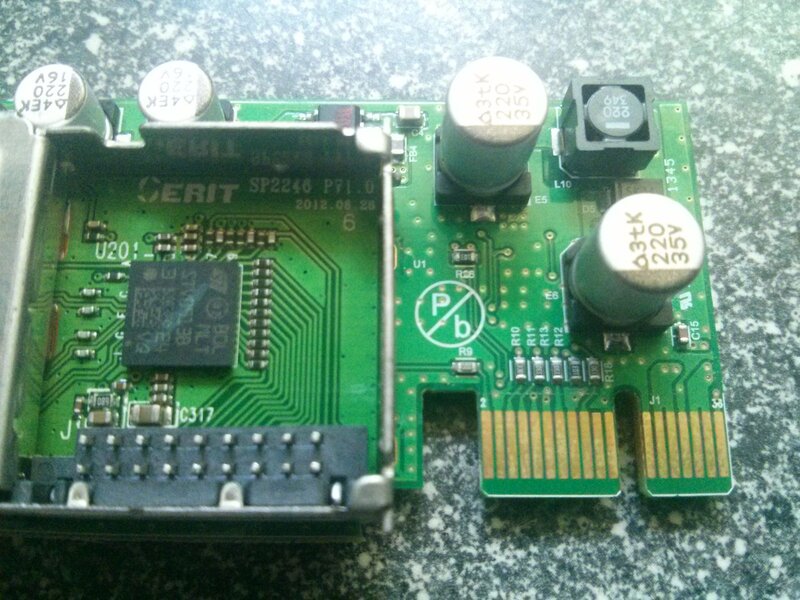 Serit provides a very detailed data sheet so at least a few of the PINs should be easily mappable with a multi meter. The German Maker supplier Watterott sells a HDMI/DVI to RGB Display adapter. 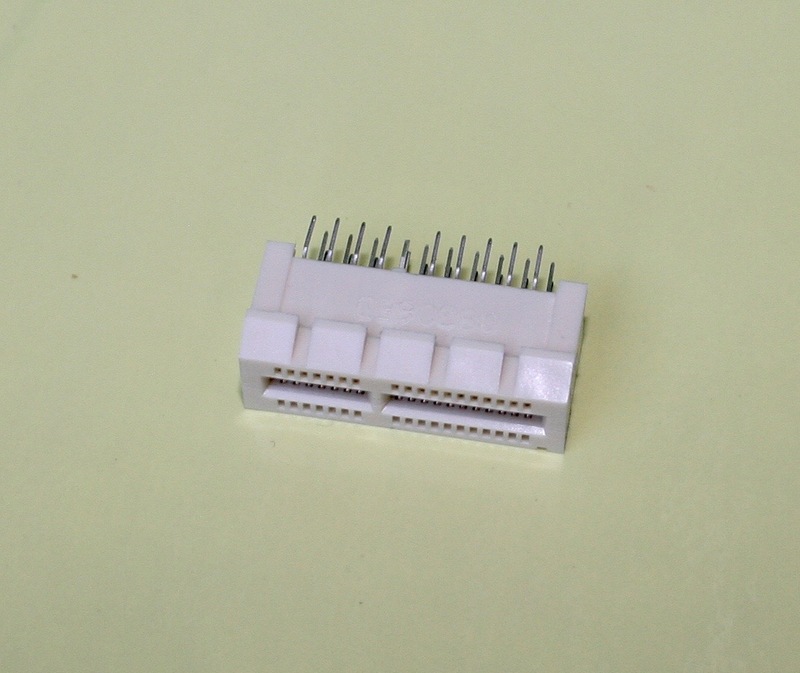 The Adapter itself contains a ATmega32U4 controller attached to USB, which works as touchcontroller. The designs and firmware for the adapter are available on GitHub. I am not sure if we can call this OpenSource because of a missing License file. 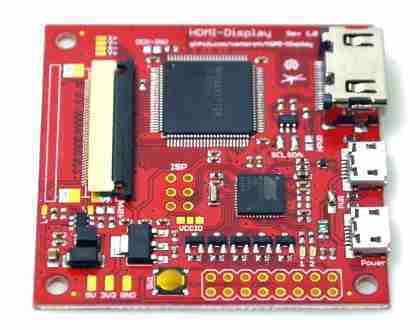 Beside the HDMI/DVI Bridge controller the board contains a EEPREOM to store the EDID data. EDID is needed to provide the attached Host device like your PC or Mac to identify what resolution and capabilities your Display has. Due to the fact that the adapter supports a wide range of displays the EEPROM is not programmed on a freshly ordered board. For me the Delock 65168 is the perfect toy to play around with EDID or HDMI CEC.